Deerhunter have become masters of the gentle 180. They regularly take themselves in completely new directions, all the while staying completely recognizable. Maybe it’s the elegantly simple, fuzzed out guitar interplay of Bradford Cox and Lockett Pundt, maybe its Cox’s floating, ethereal falsetto or every band member’s unparalleled ability to do a lot with a little. It’s incredibly difficult to pin down, and maybe it’s that implacability that makes them great. They can record albums that are clear homages yet manage to sound brand new, but with Halcyon Digest they have ceased with the tributes and finally embraced the core of their sound, the basic influences Cox has discussed for years. 50’s and 60’s pop is fully embraced and wrapped in shoegaze fuzz, Cox’s stream of consciousness lyrics have never been better, and the always creative and locked in rhythm section of Moses Archeluta and Josh Fauver is the best it’s ever been. The album is far less immediate than their preceding masterpiece, Microcastle/Weird Era Cont., and opener Earthquake brings them closer to Cox’s Atlas Sound project than they’ve ever come before. It’s a slower, more contemplative song that sets the stage for a slower, more contemplative album. Earthquake is simplistic and beautiful, with waves of guitar noise washing over the song and then retreating. The album then fully realizes the sounds first explored on Rainwater Cassette Exchange, bringing in jangly, fuzzed out pop with Memory Boy and Revival. They're pure 1960's pop, and I’d call them album highlights, but that would be frivolous on an album full of them. I’d be typing “album highlight” after every song I discuss. It’s a series of stunningly gorgeous pop songs; it takes the peaceful, relaxed feel of Atlas Sound and improves on in ten fold. That’s not an easy task, but it should be of no surprise that Deerhunter managed it. They’ve never disappointed before, and why should they start now? Desire Lines takes Nothing Ever Happened and strips away the noise, leaving the beautiful, simple shell, with Pundt’s enchanting vocal melodies and Cox’s angelic backing vocals wrapped in psychedelic guitar work. Desire Lines is the centerpiece of the most pleasant listening experience of the year, and one of the best. I’ve been listening to it on repeat for two weeks now, and I’ve yet to find a flaw. 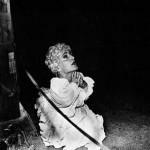 It’s Deerhunter's second masterpiece in a row, and most natural record, a one-two punch for the books. They’ve established themselves as one of the best bands in the world, and I can only see them getting better. Halcyon Digest goes by like a breeze, and when it’s finished there’s nothing better to do than play it again.